Posted on January 19, 2014 by Lena K.
Aqua Blue Cinema tells the story of how Tae, a regular high school girl, meets Yui, a young actress. Their first meeting is anything but usual, and it leads to Tae being forced to work for Yui to pay for something Yui lost the first time they met. I have to say, this is a very nice start to a romance like this, and the two characters make an interesting pairing. It’s not like this wasn’t done before, but I kind of like the look of unfashionable and childlike Tae, who’s actually the older of the two, and fashionable and mature Yui. It’s a pairing that would naturally not match that well, but then again tsundere Yui really does fit the always honest and innocently cute Tae. 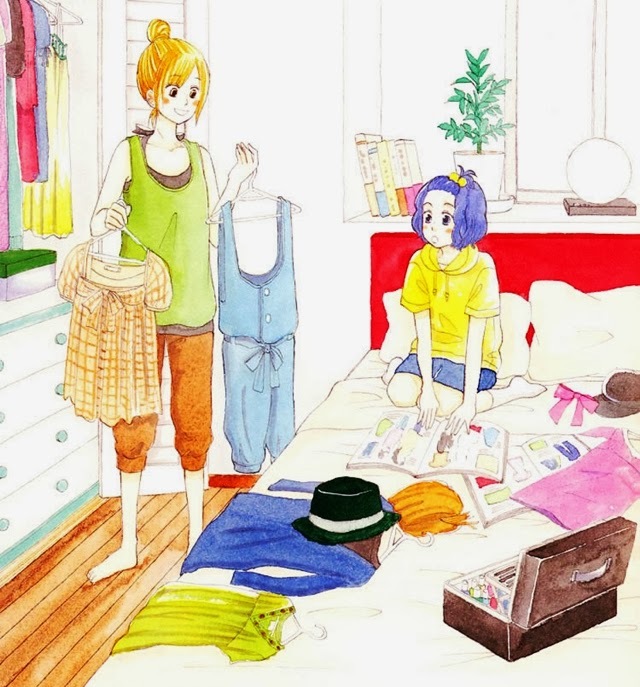 After the two meet and Yui fools Tae to work for her, they get closer and slowly built up a friendship, and while getting closer we also get some insights into the characters’ backgrounds. Yui has just recently been in a relationship with another girl that she’s still not completely over yet, while Tae isn’t experienced in this department at all. Of course, said former girlfriend needs to make an appearance as well and mess with our two protagonists a little, but it felt pretty natural and not all that forced to add in a character like this. Personally, I feel like this manga didn’t receive the attention it deserves. I’m usually a big Otsu Hiyori fan anyway, but I really enjoyed this manga a lot. 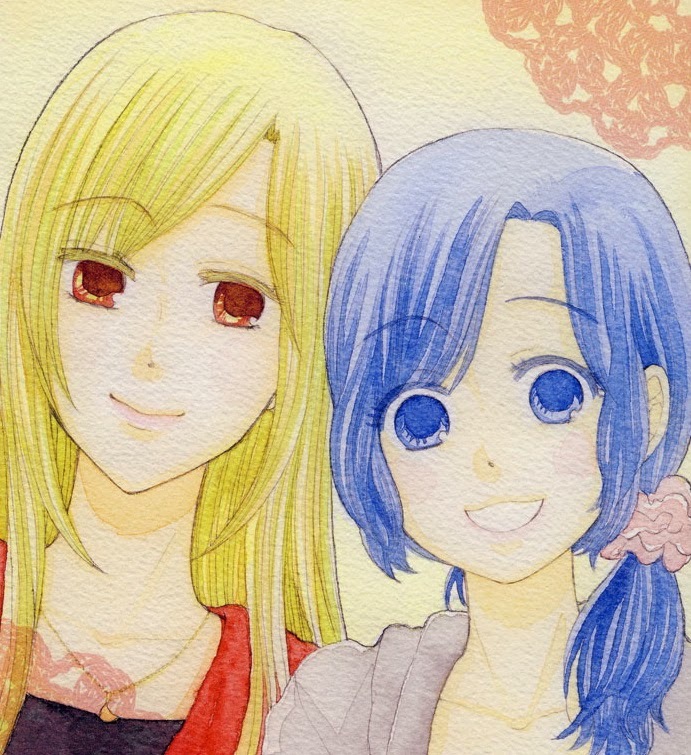 Well, it’s not all that long and doesn’t really come with anything special other manga don’t have, but I can just say that I really enjoyed reading it for what it is, a cute yuri romance. All in all, I’d say it’s easy to read, has a nice and cute story, and just the right amount of drama. Aqua Blue Cinema pretty much focuses on the relationship between the two main characters, but it doesn’t really display a lot of kisses or in general, as much intimacy as I would like to see in yuri manga, but that’s just my personal preference. Actually, the Extra was the chapter that got me excited the most. It was just super cute and I literally squealed at the end of it. The art looks a little simple if I may say so, and I have to be honest, I didn’t like Tae’s design all that much at first. She looks very childlike, which was intended anyway, but I guess I just like her with long hair and a more mature expression a lot more. Yui on the other hand looks pretty great throughout the whole thing and I really love the fact that this author also changes the hair styles of the girls and doesn’t stick with the same look for the whole manga. Otsu Hiyori is the author of my absolute favorite one-shot called “Maple Love” and I’m a big fan of her other works as well. Aqua Blue Cinema is probably not her best work so far, but definitely a nice read worthy of being read by every yuri fan. So if you want to read a cute and easy yuri romance, just read this one. 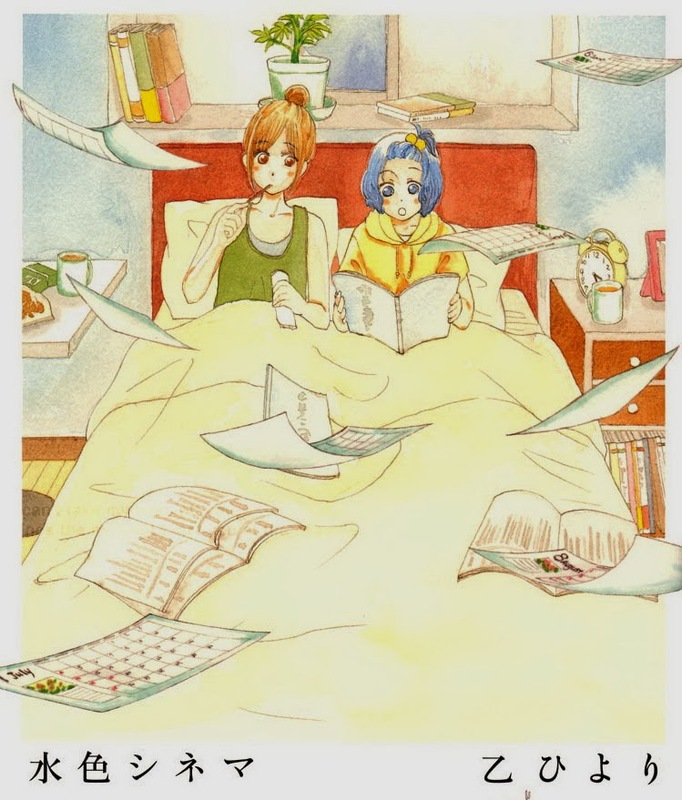 This entry was posted in Manga, Manga Review, Yuri and tagged Aqua Blue Cinema, Otsu Hiyori by Lena K.. Bookmark the permalink. I can't believe it's been so long since this series was released. Reading your review makes me want to re-read the series again. Tae's child-like feature get a bit much sometimes, but I agree with you, the epilogue was the best part of all. Do you know if the author published any new yuri manga? I'm actually not sure about that. I usually keep track of the stuff my favorite artists release, but I'm a little behind in this case. On the internet it says that the last manag she released was in 2012 and it wasn't a yuri one. Still there might be some one-shots we simply don't know about.